Botswana is always two hours ahead of Greenwich Mean Time (GMT+2); it doesn’t operate daylight saving time, so there’s no time difference between winter and summer months in Botswana. The pula (BWP) is Botswana’s currency, and at the time of writing (June 2015) £1 = P15.32; also see www.oanda.com for the latest rate. Travellers’ cheques and foreign currency can be exchanged at banks, although most camps here will take VISA and Mastercard credit cards, as well as US Dollars, Pounds, Euros and SA Rands. At most camps/lodges, there are no extras to pay. Botswana’s safari camps provide very high-quality food and drink – most serve international-style cuisine, alongside the local lager St. Louis, imported beers (Amstel or Windhoek), wines and spirits. In Botswana’s villages and towns, meats, particularly beef and goat, are very popular; millet and sorghum porridge are staples. National specialities include Morama (an underground tuber), Morogo (wild spinach), Kalahari truffle, all sorts of beans, and Mopane worms – grubs, which are served boiled, deep-fried or cooked. Drinks include the cider-like bojalwa, or homemade ginger beer. For most visitors, necessary travel distances are often small, and Botswana’s few tarred roads are excellent. Away from these, many roads are merely unmarked tracks in the sand. Botswana is generally a healthy country to visit. Several vaccines are sensible (typhoid, polio and tetanus), though none are required. Anti-malarial tablets are usually recommended. Always check the latest recommendations with your doctor or clinic before travelling, and perhaps see the Scottish NHS site for useful travel info on Botswana. In Botswana, HIV infection rates are high, and AIDS is prevalent. Generally, this isn’t an issue for travellers, but you should be aware of the situation – take the same sensible precautions to avoid infection which are wise in most countries. We understand that blood supplies used by the private hospitals in Botswana have been carefully screened for a long time. English is the official language of Botswana and widely spoken, although Setswana (also called ‘Tswana’) is spoken by almost everybody. Mother tongues include Birwa, Herero and Kagalagadi (languages of the Bantu family), Nama, Ganadi and Shua (languages of the Khoisan family), as well as Afrikaans of the European family. Travellers with British passports, as well as US citizens, do not need a visa when travelling to Botswana. For more visa information, see the Botswana Tourism Board site. Botswana’s weather and climate is typical for southern Africa, although it gets less rainfall than the countries further east. For a month-by-month description, please see our separate weather and climate in Botswana page. Most of Botswana’s camps and campsites are unfenced. You must take great care with wild animals; they can all be dangerous. Take a Namibia holiday; this is African travel at its most varied! Flying in, driving yourself, or being guided: the choice is yours. A classic Namibian holiday might include sunrise on top of the world’s highest dunes; a day relaxing in a hot mineral spring at the foot of the world’s second-deepest canyon; a wildlife safari watching lion stalk huge herds of antelope – and an evening observing wild black rhino by moonlight. You can meet a cheetah at close quarters, stroll through a petrified forest, marvel at ancient rock paintings and see footprints as old as a dinosaur – or as fresh and close as a leopard outside your tent. Namibia is a real travel adventure, like nowhere else on earth. Namibia’s range of climate and tiny population make it an easy place to get away from it all. Even its key attractions are relatively undervisited, so you’re unlikely to encounter more than a handful of like-minded people as you seek out the dense herds of big game in Etosha National Park, or take in the show-stopping scenery of the Namib-Naukluft National Park. For something more offbeat, consider Damaraland, home to black rhino, elephant and other fascinating, desert-adapted wildlife. Then there are the vast, coastal wilderness of the Skeleton Coast, the rugged mountains of semi-desert Kaokoland, and Bushmanland – which are Namibia at its most remote. If you can’t resist the thrill of adventure, then head for Namibia’s adrenalin capital, Swakopmund – where adventure activities abound, along with some exceptional excursions into the surrounding desert. Or combine adventure with the wilderness that is Fish River Canyon, a 500m-deep gouge in the landscape that makes a spectacular backdrop for hiking. And if – like many Expert Africa clients – you are drawn back time and again to explore Namibia further, consider the more verdant Caprivi Strip, where you can combine a classic safari with boat trips on narrow waterways and perhaps add on a visit to Victoria Falls. Namibia’s landscape is dominated by a central plateau, which is home to rolling hills and rich farmland. To the west, the land falls off in a dramatic escarpment down to the Namib Desert, which runs for 1,600km alongside the Atlantic Ocean, and is best known for the spectacular apricot-coloured dunes of Sossusvlei. To the east, the plateau slopes off more gradually, merging into the great sand sheet of the Kalahari Desert. 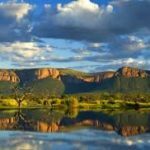 In the heart of southern Africa, land-locked Zimbabwe is a vibrant country with dramatic landscapes, impressive national parks and welcoming people. After some difficult years, it is now returning to its rightful place on Africa’s safari circuit. Home to abundant wildlife, top of the range guides and good lodges, Zimbabwe had all the ingredients for the perfect safari holiday. However, in the decade between 2000 and 2010, its politics caused great damage and distress and the number of tourists plummeted. Today, Zimbabwe is getting back on track. Politically, it still has some tensions, as many countries do, but the general situation has improved considerably and the country is far more stable. Tourism in particular is recovering, which is great news for safari-lovers. Victoria Falls’ new international airport is set to open in the summer of 2015, able to accommodate larger wide-bodied aircraft, potentially increasing travel options with direct flights. New lodges are opening across the country and a convenient univisa for access to both Zambia and Zimbabwe has just been introduced. All of this bodes well for Zimbabwe to re-emerge as a superb safari destination. Zimbabwe is bordered by two rivers, the Zambezi to the north and the Limpopo to the south. In between is an inland plateau filled with kopjes (granite outcrops), beautiful national parks, rugged mountains and lush forests. There is a huge variety of things to see and with relatively few visitors and no mass tourism, plenty of opportunity to find peace and quiet. A Zimbabwe safari can be exceedingly varied. You can go on a game drive in Hwange National Park, take a canoe safari or a walking safari in Mana Pools National Park, fly over Victoria Falls on a Flight of Angels or view the granite boulders and rock art in Matobo Hills National Park. For many visitors, a trip to Victoria Falls (Mosi-ao-Tunya – the Smoke that Thunders) is a highlight of their time in Zimbabwe. Zimbabwe, like many countries in Africa and elsewhere, has political tensions and troubles that are frequently reported in the media. For more information on Zimbabwe’s situation and on our stance, see Zimbabwe is Visiting Ethical? With the improved economy and stability, and the knock-on effect on the tourism sector, many tour operators are now going back to Zimbabwe. We at Expert Africa never left. Feedback from guests has been extremely positive: wildlife sightings have been superb and local people, delighted to see tourists coming back, have been warm and welcoming. Zimbabwe blows away visitors’ preconceptions, suggesting that perhaps the most important thing to take with you is an open mind. During the troubled times, questions were raised over the morality of going on a Zimbabwe safari. We are very clear where we stand. We use BA Comair (British Airways’ southern African affiliate airline) and South African Airways to get travellers to Zimbabwe in the first place. We then offer mostly small, independent safari operations to our travellers, throughout Zimbabwe. These are businesses, run by good people whom we have known for years. In the difficult times, trade was particularly thin – and for many their future was very uncertain. They worked hard to try to pay their staff a living wage, and to protect the animals that live in the national parks. We supported these businesses throughout those tough times but help is still needed to ensure that these people have a future and that the beautiful safari parks and wildlife of Zimbabwe will be preserved for future generations. We take some degree of pride in having stuck with Zimbabwe, believing it needed – and still needs – our support for several reasons. Firstly, ordinary Zimbabweans were innocent victims of the political situation; we shouldn’t punish them further. Secondly, if camps and lodges remained in business, tourism would be able to return swiftly to Zimbabwe’s world-class wildlife and cultural attractions when things changed – this has indeed proved to be the case. Finally, by consigning ordinary Zimbabwean’s lives to the scrap heap, we would have been giving in to some politicians intent on serving interests other than those of the majority of Zimbabweans. Tourism in Zimbabwe has helped – and will continue to help – both communities and conservation. Without tourism there would be no wildlife here, and without wildlife, there’d be no tourism. Local people benefit from employment and see a tangible advantage in keeping wildlife alive. If tourism had ceased, Zimbabwe’s national parks would have become powerless to resist pressures for increased hunting and unable to manage the threat of escalating poaching. For all these reasons, we will continue to offer trips to Zimbabwe to visitors who understand the situation there. We will continue to monitor developments in Zimbabwe, and advise any travellers if we feel the situation has changed. Throughout the 1970s and 1980s, Mozambique was in a mess – used as a pawn in the Cold War and wracked by poor governance and civil war. This drew to an end in mid-1990s, and the country started to get back on its feet. In the last decade tourism has started to grow here. Mozambique is best known for its beach holidays which can be amazing. Long, palm-fringed beaches with sand so fine that it squeaks underfoot, remarkable deltas, shady mangrove forests and freshwater lagoons; tropical islands surrounded by turquoise waters, where iridescent fish swim amongst pristine coral; this is the coastline and islands of Mozambique. Bike Rentals, based in Johannesburg, South Africa, has a range of Yamaha Motorbikes available to groups for guided bike tours – both on and off-road adventures – around South Africa and Southern Africa. 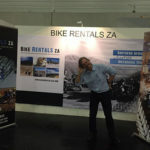 Bike Rentals has the support, professionalism and expertise of both Linex Yamaha and Yamaha South Africa behind them.